Softened water can be used to reduce scaling, for high purity water pretreatment or to reduce operating costs. For example, water softeners are installed as pretreatment in pharmaceutical, electronics and optical manufacturing processes as well as medical, research and dialysis applications. Pretreat to increase efficiency or produce high purity water. Impurities in water become an important consideration when water is to be used for different commercial and industrial applications. They can cause irreversible membrane damage to RO, equipment fouling, scaling and more. 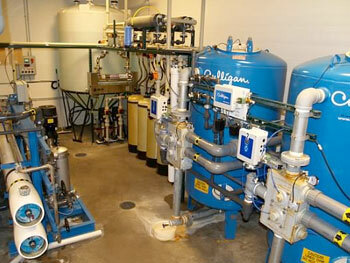 When using sophisticated water treatment systems, pretreatment of water can increase equipment efficiency, increase flow rates, increase equipment lifespan, reduce operating costs and more. Different applications call for different pretreatment systems and an expert should be contacted to determine the best solution for each application. Comply to a water purity standard. Many different lab water, medical water, pharmaceutical water and dialysis applications require a certain purity of water. Water treatment systems that provide this high purity water may need water softening technology to make the production of ultrapure water more efficient or even possible. Untreated hard water can cause increased utility bills, higher operating costs, decreased equipment efficiency and life, increased use of detergents and chemicals, reduction in linen life, dingy laundry and increased boiler blow-downs and downtime.